Every car needs a computer. Even if it's a 1955 Buick! 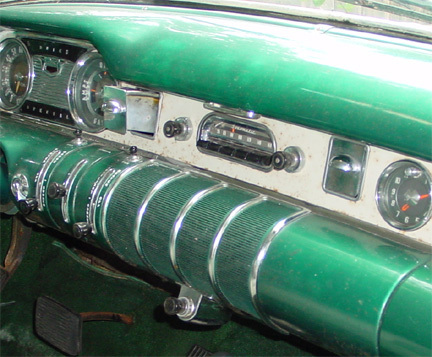 The original dealer collateral material says this about the 55 Buick Sonomatic Radio: Clear push-button reception of any five stations -- even wider station selection by dial. Well, we are just going to have to open this puppy up! All the comforts of home right at your fingertips! Click on any of the above images for more detail. An LCD touch screen is one of the first indicators that you are not riding in your grandfather's Buick. To the left is a prototype of the main screen. This is running on the Xenarc 700TSV 7-Inch TFT LCD Touch Screen Monitor with VGA input, 2 Composite Video inputs and On Screen Display. We are using the fantastic StreetDeck software. 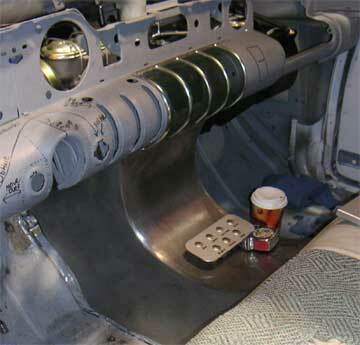 Our first test fit of the Xenarc into the Buick. It is sitting in the old speaker bay under the Sonomatic Radio. Well, not actually under the radio, in it! The Sonomatic was a giant cube that is roughly 12" X 12" X 18". We will scrape the exposed parts (the dial) off the front of the Sonomatic and incorporate this into its original place in the dash. Here we can see the old dash with the speaker grill cover sitting under the radio control. We will still utilize the grill cover to hide the display. A servo actuator will slide the grill out of the way to reveal the touchscreen underneath. When we are done, the old dash will look like the old dash! The Sonomatic on/off switch will initiate the speaker grill actuator. The speaker grill has been servo'd to the side to reveal the touch screen monitor. It is really the old radio - with a new twist and several pounds shaved off. The LCD changes to reflect what is being displayed on the Xenarc touch screen. For example, if the Xenarc is running AM/FM, then the station shows up on the LCD. If the Xenarc is running MP3, then the artist and song show up. You get the idea. Yes, the old push buttons work. Depending on what media is currently playing, the push buttons control play, pause, stop, next, and previous. The left knob controls power on and volume. The inner left knob (this used to control tone) now controls night/day mode. 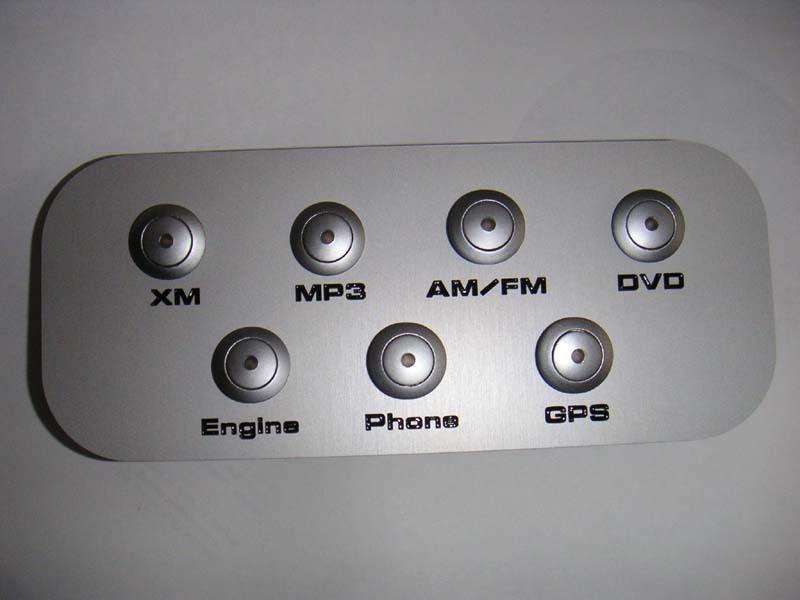 The right knob is a digital encoder that allows me to quickly scroll through and select songs from a list. An under dash console forms the control center for the Buick. 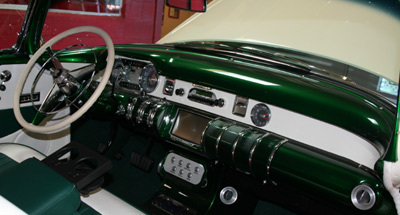 Keeping to the tradition of the original dash - it has been crafted from steel. 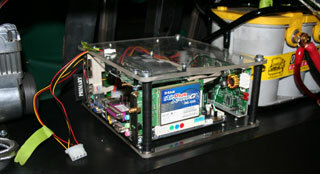 It provides a control panel, a USB hub, the air ride gauges, 12 and 110 volt power supplies, and the DVD. The console also has a handy change tray that, coincidentally, is shaped just like a bottle of Johnnie Walker Black. The primary feature of this console is the control panel. It has been Computer Designed and milled. It incorporates rugged panel sealed pushbutton switches with round buttons and bezels. 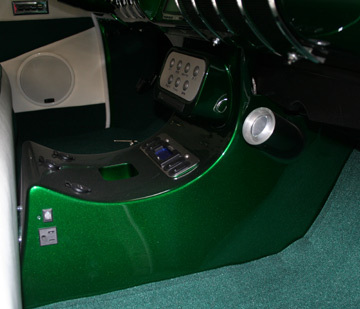 The buttons have integrated green LED's and are manufactured from a non-spark zinc alloy and are velour chrome plated. It is panel sealed and is designed to be impact resistant. The robustness and panel sealing make this switch ideal in harsh environments like the front seat of my car. It is awfully close to the drink holders, after all. You could control all of the features from the Touch Screen, but the control panel let's you exercise the basic human desire to push buttons. When a function is selected the green LED associated with that function lights up. 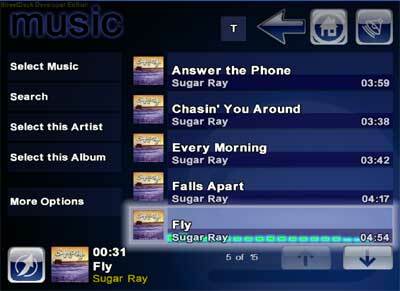 Conversely, when selection is made from the Touch Screen, the control panel also reflects your selection. 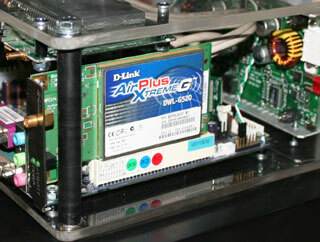 The Console takes shape in June, 2004. This picture was taken before the 7 button panel and AC outlets were grafted on. The console in a complete state. Notice the AC outlet! You can always use this for the blender, etc. 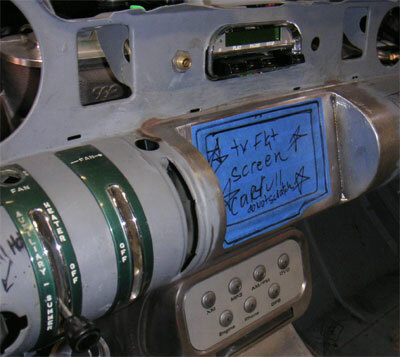 The radio control, touch screen (under all that blue tape) and the console in Feb, 2005. Notice that this picture has the speaker grill cover removed. The system resides on the package tray at the back of the trunk. It sits between the battery and the air compressor. This tray is covered during normal operation. Thus, the computer will remain hidden. This is my in-dash unit. This is a thin, slot load DVD. All other components will fit in the trunk and are out of view. This fits nicely in the under dash console in a horizontal attitude just under the 7-button interface. The Buick will emit GPS information to onboard (or close by) devices via this Socket GPS Receiver. When combined with a D-Link USB Bluetooth DBT-120, this GPS Receiver will feed both the onboard software running on the Mocha box and a handheld unit. Kill two birds with one Bluetooth. One of those close by devices will be a Pocket PC. The Pocket PC will be running mapping software. This will let people in the car act as my navigator so I won't have to take my eyes off the road. It will also let people in the back seat operate many of the systems controls. Let's take back seat driving to a new level. "Andy, there appears to be a Marshal's 1.2 miles away and a Pier One Import 500 yards to the left..."
The Socket GPS Receiver has a great external antenna that will probably be mounted either on the rear deck, inside the car, or externally outside the rear deck between the trunk and the glass. We'll have to see what kind of reception we get if it is placed inside the car. The antenna has a strong magnet that will keep it in place. If it goes outside the car - it will be permanent and will be adheased to the surface somehow. Can you paint these things? I need 802.11 to synchronize the car jukebox and software with my home system. While parked in the garage each night, the system will download the latest music and patches. It may make sense to have the Pocket PC also capable of communicating Wi Fi with the Buick. This would give me a greater range when using the Pocket PC as a remote control. 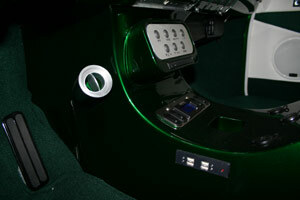 USB ports are built into the side of the center console. This can come in handy if I need to plug in a keyboard, mouse, iPod, game controller, electric shaver, etc.